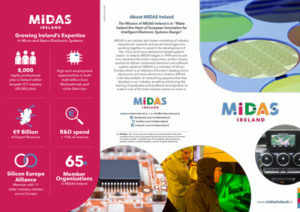 MIDAS Mission - "Making Ireland the Heart of European Innovation for Intelligent Electronic Systems Design"
How can MIDAS support you? MIDAS is an industry led cluster consisting of industry, educational, research and government agencies, working together to assist in the development of the 'micro and nano-electronics based systems sector' in Ireland. MIDAS began in 1999 and its aim is to represent the entire value chain, as the industry evolves to deliver combined electronic and software system solutions. MIDAS is a member of Silicon Europe which is an alliance of Europe's leading microelectronics and nano-electronics clusters. MIDAS is the key enabler of networking opportunities that develop in our industry, as well as enhancing the training of graduates and professional engineers; to make it one of the best industry sectors to work in.